I teach garment sewing classes for adults in a relaxed atmosphere where students can advance their stitching skills while making amazing clothes! I have a positive, encouraging approach to teaching that balances solid construction techniques with a fun social experience. My classes are structured so that you grow your abilities and your confidence over the course of the class. 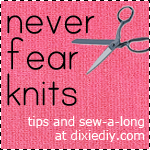 You’ll practice new skills, learn helpful tips and tricks, and develop good sewing habits. You’ll be proud of what you make in class and you’ll want to sew even more! Sign up for a class with me at The Cloth Pocket in Austin, TX! Want to stay in the loop on new classes? Sign up for the DixieDIY Classes newsletter! Once a month you’ll receive an email featuring upcoming classes + tips, tricks, and tutorials for better sewing.